To order a printed copy of the Visit Alderney 2019 brochure, simply click the Request button below. Discover the tiny island of Alderney, a few miles from England and just off the Normandy coast, where you'll find everything that makes the perfect holiday. Alderney has natural beauty, an absorbing history combined with delightful indulgence. Whether you enjoy gentle walks or energetic pursuits such as cycling, fishing or sailing, it's the perfect blend – and the perfect balance, offering an original experience that simply can't be found elsewhere. Alderney's fascinating history is written in its landscape and architecture; from the Stone Age through to the Romans and with military importance in recent centuries reflected in its many Victorian forts and fortifications dating from the Occupation during World War II. The atmosphere is reassuringly familiar, yet distinctively different. There's no language barrier, no currency to exchange and no problem finding your way around. At the same time, the island has an unmistakably French feel, giving you the chance to sample the unique culture and lifestyle of a Channel island. Reaching Alderney couldn't be easier. The flight from Southampton or Guernsey is less than an hour long and with no lengthy queues on arrival you'll be immediately eased into island life. The more you put into your time here, the more you'll get out of it. If you love to explore, experiment and discover, the rewards are rich and varied. Visit Alderney and be free to enjoy the holiday that you want. So close, so different. Visit Alderney 2019 Brochure Dawn H. said: visited Alderney in the spring after reading the brochure. Visit Alderney 2019 Brochure Carole K. said: It looks interesting.Somewhere I have never thought of going to before.Its always good to see new places.They say that travel broadens the horizons. Visit Alderney 2019 Brochure Farooq K. said: Just great! 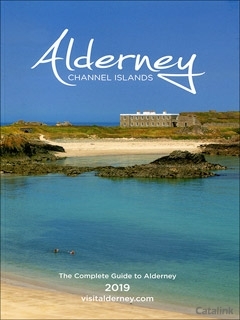 Visit Alderney 2019 Brochure Jenny W. said: made me want to try Alderney! Visit Alderney 2019 Brochure Walter S. said: A colourful and well printed brochure. Spend a day exploring Alderney's south cliffs and the spectacular views of the gannets on Les Etacs. Like @aaronpycroft, let your hustle and bustle behind and come to discover the peaceful island of #Alderney! By pressing the Request Printed Brochure button you give consent to Visit Alderney 2019 (and their Data Processors for the specific purpose of delivering your literature) to send you their Brochure .